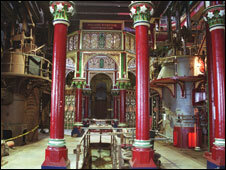 A Victorian pumping station, built to clean up a then heavily polluted River Thames, has won £1.5m from the Heritage Lottery Fund for its restoration. 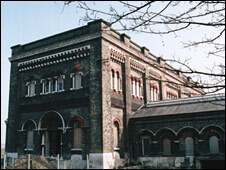 Crossness Pumping Station in Abbey Wood, south-east London, was built by Sir Joseph Bazalgette. It was commissioned after the Great Stink 150 years ago, which almost forced MPs to abandon the Houses of Parliament, and opened in 1865. It was part of a new sewerage system with miles of drains under the city. Hot weather and pollution led to the stink which prompted politician Benjamin Disraeli to describe the river as "a Stygian pool reeking with ineffable and unbearable horror". The Grade I listed former pumping station in Abbey Wood, which houses what are thought to be the four largest rotary beam engines in the world, was officially opened by the then Prince of Wales. It remained in service until 1956. The Romanesque style building, which features ornamental Victorian cast ironwork, fell into disrepair and was listed on English Heritage's Buildings At Risk register. Since the mid-1950s the engine house and engines were "vandalised and left to decay", the Crossness Engines Trust said. A £2.7m project aims to refurbish and conserve the historic station and the revamped building will have a new exhibition on the site, a cafe, car parking, education room, archive and website. English Heritage also announced a grant of £150,000 towards the project. Peter Bazalgette, Sir Joseph's great-great-grandson and president of the Crossness Engines Trust, said: "The Trust's volunteers have worked tirelessly to restore one of the magnificent engines and to create an experience which visitors already enjoy. "This project will allow us to improve on that experience, safeguard the fabric of the buildings and make possible new community ventures that will allow this monument to Victorian engineering to take on a new lease of life."